I love experimenting with new ways to use foods in recipes and one of my favourite foods at the moment is avocado. 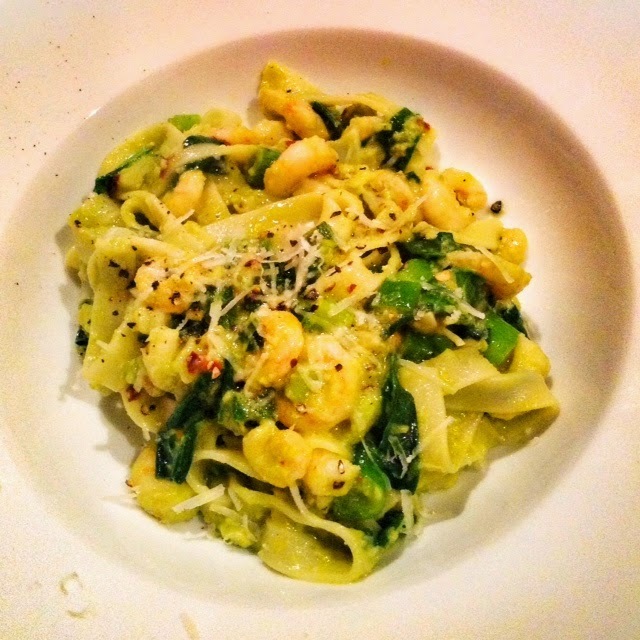 Whether it’s in guacamole or in a nice big salad it’s such a fresh and different taste, I can’t get enough of it so this week I decided to see if I could come up with a way to use it in a pasta dish. After doing a bit of research I came across a recipe on Kevin and Amanda’s blog and it looked so delicious, I decided to adapt it into a lower propoint option. I was absolutely delicious. The OH said it tasted completely different to any pasta we had had before and the flavours were so tasty and satisfying. I used tagliatelle pasta as the sauce stuck nicely to it, but feel free to use whatever pasta takes your fancy! 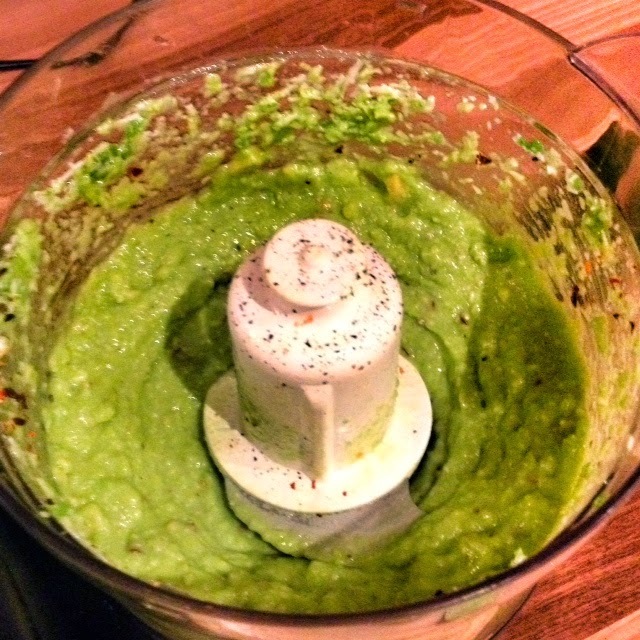 Halve the avocado length ways and destone, then spoon out the flesh of the avocado and add to a food processor. Discard the skin. To the food processor add the parmesan and lemon juice, season well and begin to blend. Add 1-2 tbsp water so the paste becomes smooth and starts to loosen up. Add a drop of tabasco and a pinch of crushed chillies (to your taste) and blend for a few more seconds. At this point pop your pasta on to boil. Then pop a frying pan onto the heat and add butter. Cook until melted. 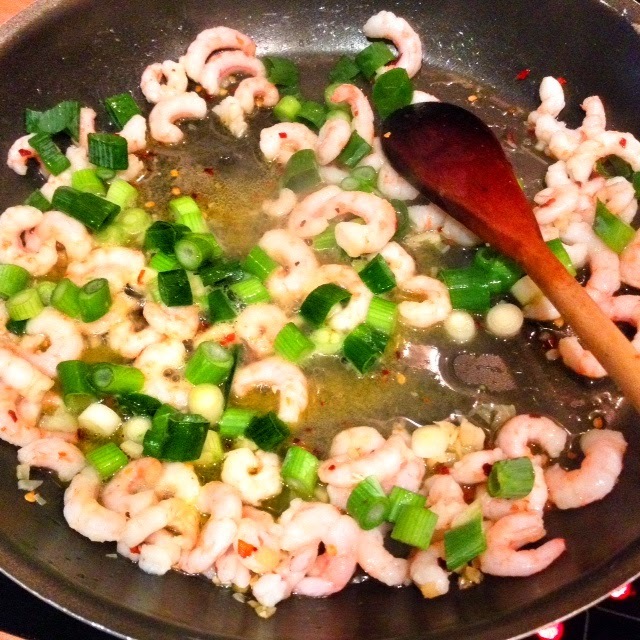 Add your garlic, fry for 30 seconds and then add your prawns and crushed chillis (to your taste). Squeeze on a little lemon and then once the prawns have started to pink up, add your spring onions and cook for another few minutes. Next add your avocado mix to the pan and splash in a little of the pasta water (I also added more tabasco at this point as I love it!). Season, add a little squirt of lemon and then add your spinach. Cook until spinach is wilted. Once pasta is cooked, drain and mix into avocado sauce. Serve with a little parmesan on top and a slice of lemon. I made this tonight and have never used avacado before, not sure how I would like it. It was absolutely delicious, and so creamy. I made a few tweaks with the chilli as I don’t like things too hot, and used half a fresh red chilli, that was about right. I will definitely be making it again, I also served it with a good green salad. Looks very interesting as I love avocado. How would you adapt this for a vegetarian?